We’d love your help. 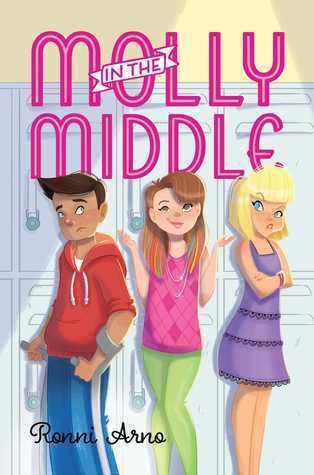 Let us know what’s wrong with this preview of Molly in the Middle by Ronni Arno. Twelve-year-old Molly Mahoney is in the middle of everything. She’s in the middle of her parent’s impending divorce. She’s in the middle of her rebellious older sister and her lazy younger sister. She’s in the middle of her class, ranked at exactly 143 out A girl finds herself in the middle of a big decision—follow the crowd or follow her heart—in this hilarious M!X novel. To ask other readers questions about Molly in the Middle, please sign up. Molly's parents are very harried and busy, and one morning, Molly's father gets all the way to her younger sister Coco's school before realizing that she isn't in the car! Feeling very beige, Molly decides to dye her hair multiple colors and sneak an outfit out of her sister's closet. For the first time, people look at her in school, and the very cute Robert asks if she can help him dye his hair. Former friend Nina and new bestie, Christina, invite her to sit with them, seeing that she's gotten Robert's attention, saving her from having to hide in the library at lunch. This is the first year that her best friend, Kellan, hasn't been in school; his mother is home schooling him because she is overly protective of his muscular dystrophy. Molly sees Kellan a lot outside of school, and the two are planning on doing a fundraiser walk for MD, but her new friends make fun of him, and she is enjoying her new popularity too much to defend him strenuously. Robert isn't a great student, but he's nice enough, and he pays attention to Molly. As her parents' fighting gets worse, and her mother goes to stay with a sister, leaving Molly to supervise Coco and watch her older sister Eliza implode, that attention makes her feel better. When Christina plans a spectacular party at her country club on the same day of the MD walk, Molly tells Kellan she won't be able to go with him. Will Molly decide that her new friends are worth the sacrifice of her best friend? Strengths: This was brilliant in that it plays to a deep psychological need middle schoolers have-- to be popular for who they are. Molly only changes her hair and clothes (with a little sass for Ms. Littman), and yet her old friend Nina comes back, she gets a cute boy writing his number on her hand, and she gets invited to THE most exclusive party of the year! She still gets to hang out with Kellan. The best part? When she ditches Kellan for the party, he actually understands why she did it and forgives her. Of course, it helps that she feels bad. The home environment is also unfortunately realistic; for as many middle grade novels as there are where Really Horrible Things Happen and the parents are prostrate with grief, there are really few books where the parents are just self absorbed and being serviceable but not good parents. The father comes out looking best in this one, and I liked how he listened to Tessa's very reasonable critique of her childhood experience. Kellan is also a stand out character, trying his best despite his overprotective mother, and growing when he doesn't have Tessa to help him out. Weaknesses: Mrs. Littman's little talk with Tessa about her choice of friends, while circumspect, was unwise. I vividly remember Mr. Clingerman, my 8th grade science teacher, telling me that my best friend, Lori, was not a good influence on me. I was a good kid, and this just made me mad, and it made me dislike him a lot! So cute. I really, really loved Molly. Let me start out by saying: I LOVE THIS BOOK!!! In this book, Molly must decide who she truly wants to be, or become. I have read this book many times, and I could read it a hundred more. Hooray for Molly!!!!!! Middle school, middle child, in the middle of her parents divorce and feeling left behind and left out, and smack dab in the middle of it all! Caught between a new group of popular friends and her best friend with special needs, she is torn about what to do! Will she make the right decision? Someone's feelings might get hurt in the process, including her own. Nobody's perfect, and we all make mistakes. Can Molly make the right choice? I wish I had this book it was so amazing I’m gonna read it again!